Nativity began as a parish without a church. It was compared to the days of Moses when people met in tents proving that “church” is more about people than a building. 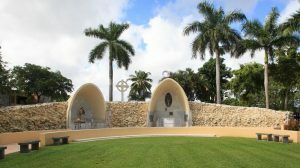 Bishop Coleman F. Carroll established the Church of the Nativity of Our Blessed Lord in the then Diocese of Miami on August 23, 1960. Fr. 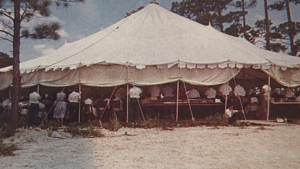 Hugh J Flynn, the appointed Pastor, celebrated the first mass in a large tent, which was erected as a circle for 1200 parishioners. Over the course of the next two years, mass was held in various places throughout Hollywood until the completion of the first school building in 1962. At that time, the first floor housed the church with the second being utilized as classrooms. 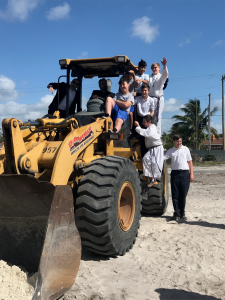 With a rapidly growing parish, 2200 families by 1966 and a long waiting list of students to enroll at the school, Nativity had quickly outgrown its first building. 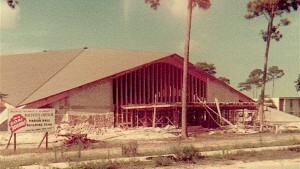 Groundbreaking for the current church occurred on November 5, 1967 and was completed within one year. The long awaited dream of a Church came true on October 26, 1968, with the dedication of Nativity Church. The Parish Hall also opened the same year. 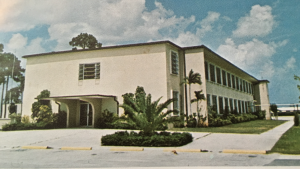 On June 24, 1974, the South Broward Deanery of the Miami Archdiocesan Council of Catholic Women selected Nativity Parish to host “Something Beautiful for God: A Day With Mother Teresa”. This diminutive Woman of God from Calcutta, India enchanted all who were fortunate to attend. 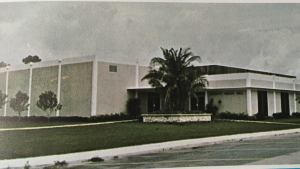 In June of 1979, a new rectory and office building was completed and Auxiliary Bishop John Nevins blessed the facility. On November 23, 1980, the groundbreaking ceremony commemorated the beginning construction of the Fr. Hugh J. Flynn Parish Center, a multipurpose building for kindergarten and junior high students. It also included a teachers’ lounge, conference room, office, counseling office, and a music/meeting hall. The Fr. Hugh J. Flynn Parish Center was dedicated on September 6, 1981, with Archbishop Edward A. McCarthy officiating at a con-celebrated mass. In the spring of 1985, several major improvements to the church included new red carpeting and upholstery for the church pews. 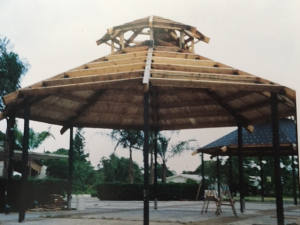 1985, Nativity celebrates its Silver Jubilee and through a generous bequest of Albert and Marie Bianchi, Nativity will add a pavilion to extend the scope of Catholic Education. 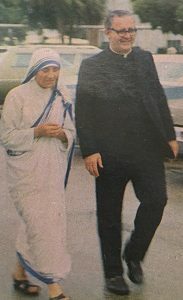 1986, Fr. Patrick Murnane was assigned as pastor. Gazebos were added to the outside of the church and the walls to the chapel were removed which opened the entire church. The altar was replaced with Italian marble and beautiful stained glass windows were installed. 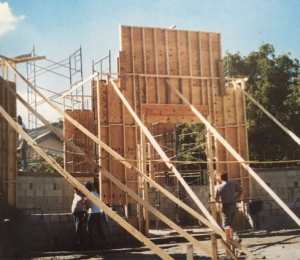 In September of 1994, ground was broken for the Shrine of Our Lady of the Smile, which was completed in 1996 and dedicated on Mother’s Day by Archbishop Edward A. McCarthy. The Blue Lantern Café and Gift Shop opened in late 1997 and by 2000, the parish had over 3500 registered families; Nativity School had approximately 760 students in grades Pre K 3 through 8 and the CCD program had an enrollment of about 450 public school students and 150 in the Spanish CCD program. On March 14, 2010, Nativity celebrated its Golden Anniversary. 50 years: in that time, 75 priests had served the parish and five pastors led Nativity through growth and change. 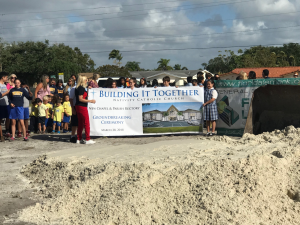 The church was built and remodeled, the school constructed and expanded, a parish hall, and The Father Hugh Flynn Parish Center were added as well as Our Lady of the Smile Shrine was constructed and a statute honoring immigrants was erected. Nativity continues to grow and change. On February 1, 2015, Father David Zirilli became the pastor of the church. 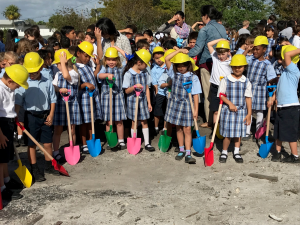 With his vision, the church is in the process of facility improvements and adding new technology bringing this incredible parish into the 21st Century. 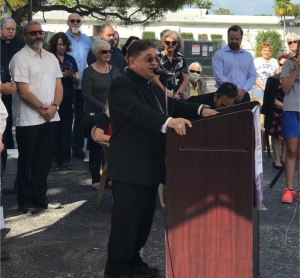 Miami Auxiliary Bishop Enrique Delgado presided at the March 28, 2018 blessing and groundbreaking ceremony for our new Rectory-Office-Chapel Project, and please keep this project and its workers in your prayers. O God, who have told us: “Unless the Lord build the house, in vain do its builders labor,” we humbly beseech your mercy and blessing upon our parish. With mighty hand and outstretched arm, protect this ground we intend to sanctify to your name and keep safe those who set foot upon it. Bless our efforts as we raise a temple for your glory and the salvation of souls. May the house of prayer we intend to build bring both the faithful and the lost ever closer to your Son, Jesus Christ, who lives and reigns with you, in the unity of the Holy Spirit, one God, forever and ever. Amen.